The 14th edition in a series of posts that highlight one Expert Author who has achieved success by doing just one thing exceptionally well. 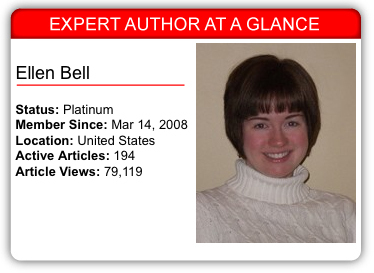 Ellen Bell sets herself apart as an Expert Author with her research. Specifically, she analyzes Article Reports to point her in the direction of new content. According to Ellen, all articles on her account become case studies for future articles. She closely analyzes the ones that have the most views and highest click-through rates (CTRs) for effective title formats, content presentation methods and Resource Box information. This close analysis helps Ellen determine exactly how to put the pieces of her next article together. Ellen’s drive to write on a variety of topics means she has to spend extra time organizing article ideas and putting cohesive article sets together. When she looks back at the time she has devoted to article writing and marketing, there is only one regret. “I’d probably take advantage of setting up various pen names on my account from the get-go, and then make sure that all articles of one topic or field were only submitted to one specific pen name, so I could achieve greater subject-matter authority on each of my various topics,” she says. Staying organized while building credibility in multiple niches is made easier with alternate author names. Each niche can have its own author name. Use Article Reports to enhance your writing. Build a well-rounded pool of articles on a variety of topics. Don’t stop until you’ve written at least one good article in each writing session. Tailor your writing topics around the content of your website or blog. Provide useful information in every article. Partake in brainstorming sessions to keep your writing fresh and new. If you write in a variety of niches, use alternate author names to separate them. Now that you’ve read all of Ellen’s lessons, it’s time to unleash your own creative urges by writing an original, high-quality article on a topic you’re passionate about. Be sure to leave a comment here to let Ellen know how she has inspired you! Thats where progression of ideas comes from -“take it a step further.” I understand your fear and it is hard to step out of that however the more you write the more confidence you will develop. Good luck. What I would love to know is “how many article views per day is a good number?”. It’s clickthrus to your site that matters. and approx 50 clickthrus from those 2000 page views. I like th idea of analyzing the article that has the highest click through rates for effective title formats, content presentation methods and Resource Box information. I just started looking at my article reports and found some great info on where to go with future articles. Write what the people want and they will come. Do you have to pay for an upgraded account to get detailed article reports? Every membership level has access to reporting in the members account area. Premium members have additional reporting available to them. All Platinum and Premium members receive an email monthly that includes a recap of the performance of their articles. A Platinum membership is free. Premium is a paid subscription (http://ezinearticles.com/premium/) Keep in mind that the Premium subscription enhances your membership level so you can hold a Platinum membership and purchase the Premium subscription. Premium is not a membership level. Penny, thanks for the explanation. I found the article reporting/ stats in my member account. One more article written and I’ll be in the queue for Platinum membership. I’ll look into the paid Premium option as well. Where is the best place to find out its benefits/ features? Thanks! Great case study of a great author. I must make more use of those Article Reports. You certainly inspired me just by the amount of articles you’ve written! And I’m also impressed with how you analyse them to learn what is working successfully and build on that. I write because my son and I run a wedding event facility for weddings, parties and reunions, you get the picture. My goal is to inform people of how to make their job easier by educating about the process of planning a wedding, event etc. Issues like contracting, saving money, how much time to schedule between the ceremony and the reception etc. Any advice on increasing page views would be appreciated… it makes our job easier!